You can decide which of the three keys you want shown, then manage their appearance and status change behavior. 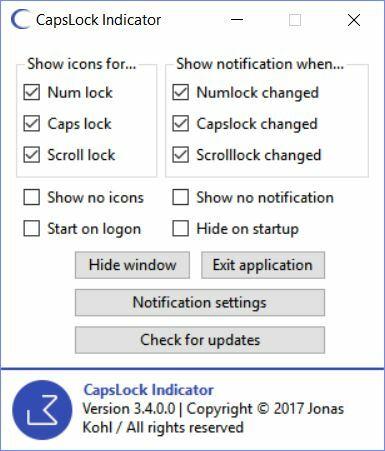 When CapsLock Indicator Shows Key States, What Happens? By default the key indicators show up as white text against a purple background. (The program provides controls for most of these things.) When you click a lock key, it changes background from purple to green with a white outline. This makes it easy to tell with a glance if the key is on or off. I don’t use the Scroll lock key myself, so I turned it off in the UI. In other words, I unchecked the box next to “Scroll lock” in the upper left UI pane. Other than that, I only had to drag the C and N icons from the pop-up notification area onto the static notification area on the toolbar to keep them visible all the time. This ia great tool, especially for touch typists like me who get discombobulated when Caps Lock or Num Lock get turned on unintentionally, or get left on longer than I need them activated. It’s nice to know what’s what, and this tool helps provide that info without forcing me to check lights on the keyboard. If you like this behavior as much as I do, grab yourself a copy today. It’s free.